Formulated from 100% natural ingredients, concentrated with advanced tecnology, this solution is non-toxic, is effectiive in removing odour and sterilizes the environment. 1. Effectively breakdown ammonia gas from bird's droppings. 2. Reduce nitrite contents in bird nests. 3. Reduce foul smell from dense environment, molds and bird's dropping. 4. Refresh the air and provide a more comfortable environment, enhancing swiftlet population growth. 5. Remove smells from bats, owls, and other unwanted bird's droppings. Dilute with water (suggestion: 2 parts Air Purifying Solution to 1 part water). Spray around the internal surfaces of the swiftlet house and on bird's droppings. Faster swiftlet population growth and safe consumption of nests can be assured if this product is used regularly. 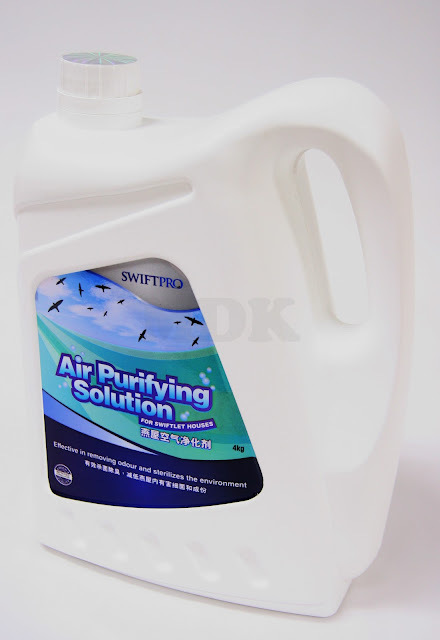 This product is a must for organic swiftlet houses.